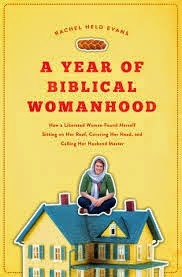 a book chick: "The Year of Biblical Womanhood"
"The Year of Biblical Womanhood"
my take: When I surveyed the Festival of Faith and Writing authors and books to read in preparation, I saw this title and thought, "No way I'm reading that!" because it sounded pious and/or fundamental .... Then I read an article by Rachel Held Evans (RHE) on Facebook and thought, "WOW! This chick can write ... and we're aligned theologically." OKAY. I judge books by titles. This sounded like something that was going to give a prescription for Christian womanhood that I'm pretty sure I'm not. Who needs more condemnation? No one. Which is why I love this book ... RHE digs through the modern fundamental view on the Biblical woman and is able to free women everywhere from the misconceptions ... especially with regards to the Proverbs 31 woman. SO LIBERATING. And funny. This is similar to Flunking Sainthood and The Happiness Project in that it's a year of doing something (I have a cookbook from a blogger who did 365 days of crock pot cooking that's dynamite Make it Fast, Cook it Slow) and the format is fine if I don't read too many close together. I'm an RHE fan for life. And I got to see & hear her at the FFW. Can you say GROUPIE? !